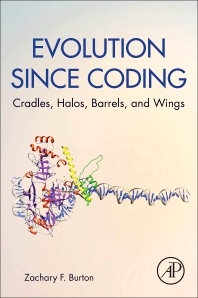 Evolution since Coding: Cradles, Halos, Barrels, and Wings describes genesis of metabolism, transcription, translation, cell structure, eukaryotic complexity, LUCA (the last universal common (cellular) ancestor), the great divergence of archaea and bacteria, LECA (the last eukaryotic common ancestor), extinction, and cancer in very simple ways. The work (almost) "synthesizes life from scratch" (since coding) and describes the tools for readers to check the author’s work. As a result, readers understand living systems and their evolution in a conceptual way and are empowered to utilize powerful but accessible tools in computer-based biology. The work serves as foundational reading for a variety of researchers, academics, and students in life sciences, for example in evolution/evolutionary biology, biochemistry, genetics/molecular genetics, molecular biology, cell biology, and microbiology, as well as disciplines beyond biological science. Its approachable style makes the book accessible for introductory students and educated laypersons. Evolution since Coding is suitable to supplement college courses that mix computers, evolution, and biology from freshman to senior level. Dr. Burton has been a professor at Michigan State University since 1987 and is also Director of Undergraduate Education in the Department of Biochemistry and Molecular Biology, as well as Principle Investigator of the Burton Lab at MSU. His research is on RNA polymerase mechanisms and ancient evolution of transcription and translation systems, on which he has published several papers. He is interested in the genesis, divergence, and complexity of life on Earth, told in core protein and DNA sequences. I wrote this book as an updated story of genesis, written from a scientific point of view. The book uses preserved RNA and protein motifs to decode some of the first RNAs and proteins, which remain conserved after about 4 billion years of evolution. So, this is a story of decoding life using existing sequences and motifs. I also tell a credible story of eukaryogenesis (the birth of eukaryotes) based on the published work of others. To me, the story of genesis is the core story of life on earth. Very good organization of the text and interesting concepts. Some ideas could have been explained better for readers less familiar to the field.